With winter temperatures on the east coast hovering between 8° and 17°F (-13 and -8°C) and sunny San Francisco boasting temperatures around 58°F and upwards (+14°C) spending a romantic weekend at Campton Place - A Taj Hotel, was the perfect place to chase away the January winter blues. 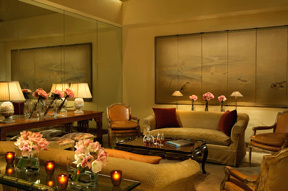 The historic hotel is a small luxury boutique with only 110 (9 are suites) opulent guestrooms, yet it is large on amenities. Entering the attractive marble lobby I immediately noticed the sparkling crystal chandelier and sumptuous floral arrangements on a large marble swan and glass table, the Asian screen along one wall, corduroy sofas accessorized with spice colored silk decorative pillows, and tobacco supple leather arm chairs flanking an ornate black and gold coffee table creating an intimate and inviting seating area. For guests looking to get more exercise than just walking up the hills of San Francisco, there is a well-equipped Fitness Center located on the 9th floor of the hotel, and the hotel also provides guests with an interesting jogging map. 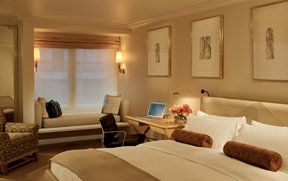 Traveling without a laptop is not a problem at Campton Place - A Taj Hotel, which has a convenient Business Center on the lobby level, and also on the 2nd floor, which Edward and I used throughout our stay. Business travelers will also appreciate the complimentary car service available in early morning and mid-afternoon to whisk you away to your nearby meetings. The hotel has lovely little details including Matisse signed and numbered lithographs that grace the lobby walls leading to the intimate Campton Place Bar and Bistro which features casual dining and an innovative cocktail menu including their signature cocktails, the Campton Cure (Ketel One Citron, Lime, Cointreau, and Cranberry Juice); the Cucumber Gimlet (Ketel One, Kaffir Lime Leaves, Cucumber, and Lime); and the Caipirinha Verjus (Leblon Cachaça, Lime, Red Grapes). 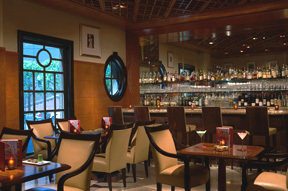 In addition to their creative cocktails, the well-stocked bar offers a wide selection of spirits as well as wines and champagnes by the glass. Tea drinkers will appreciate the intriguing tea menu including Pu-erb, Green, White, and Herbal selections, and a tea that definitely caught my eye was the Cold and Flu Blend. 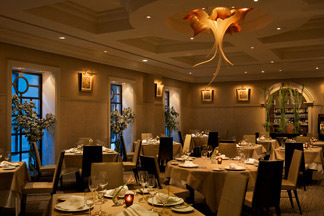 Executive Chef Srijith Gopinathan is the talent in the kitchen of Campton Place Restaurant, their gourmet restaurant, complemented by the skills of Master Sommelier Richard Dean who orchestrates the 20,000-bottle wine cellar. One of 150 active master sommeliers worldwide, and one of only 68 in the United States; Richard Dean was the youngest person to receive the title of Master Sommelier, and was the second person in the United States to receive this distinguished honor. We had a memorable nine-course tasting dinner at the restaurant with wine pairings, where a few of the many highlights of the dinner included Jerusalem Artichoke Soup with Slow Cooked Hen Egg, Truffled Tapioca Pearls and Dry Ginger Dust, paired with a Grüner Veltliner Laurenz V Kamptal 2006; Roasted Red Beet, Beet Curd, and Andante Dairy Minuet Cheese Snow paired with a Sancerre Alphonse Mellot, Loire Valley, 2007; Barely Seared Scallops, Almond Soup, Fig Compote and Prosciutto Ham Chips paired with a Chardonnay Silver Mer Soleil Unoaked, Monterey County 2006; and Braised Beef Short Ribs, Truffled Potatoes, Wild Mushroom, Salsify, and Braising Juice paired with a Cabernet Sauvignon, Salvestrin Estate, Napa Valley 2004. 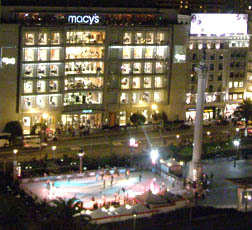 From our spacious 14th floor corner guestroom, we had a sensational view of Union Square where we could watch the ice-skaters gliding around the ice while palm trees framed the seasonal ice rink. A lounge chair with ottoman and a comfortable window seat with decorative gold and beige pillows were perfect for reading from the selection of magazines and newspapers as well as viewing the large Samsung high-definition television. There was a desk and beige upholstered wood chair in the corner of the room, which had a silver desk lamp and ample workspace, and was brightened up with a pretty yellow tulip in a white bud vase. The king bed was pristinely dressed with a white duvet, burgundy, green, and gold paisley decorative bolster pillows, a taupe soft throw placed at the end of the bed, and a beige fabric headboard. A round bedside table dressed with an attractive linen skirt, featured a tall glass and silver lamp with ivory shade and a selection of magazines was placed on one side of the bed, and a wood nightstand with drawers held a tall glass and silver lamp with ivory shade, and Bose Wave Radio/CD/alarm clock, on the opposite side of the bed. A floor-to-ceiling silver framed mirror hung on one wall opposite the bed, and a silver framed lithograph of San Francisco hung over the bed adding visual appeal to the room. We returned to our room each evening, we looked forward to reading a new little bedtime book placed in the wooden box on the bed alongside the breakfast menu. The large limestone bathroom featured a combination soaking tub/shower, a large vanity area with a selection of Moulton Brown amenities, hairdryer, scale, and a vanity/shaving mirror. Guestroom amenities included an espresso maker and an electric tea kettle, mini-bar, safe, and ample closets featuring an iron and ironing board, umbrellas, safe, slippers, and soft knit robes, which we first experienced at the Campton Place - A Taj Hotel's sister property, the Taj Boston. 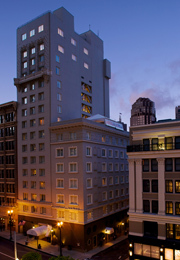 Conveniently located in the heart of Union Square, the area features designer boutiques as well as the department stores Nordstrom, Saks, and Macy's, is close to the theatre district and the historic Trolley to Fisherman's Wharf making the hotel a perfect base to explore the city of San Francisco. Read other articles on Campton Place - A Taj Hotel in the Destinations, Restaurants and Chefs' Recipes sections where Executive Chef Srijith Gopinathan and Master Sommelier Richard Dean share a delicious recipe with wine pairing to tempt your palate. Read other articles on San Francisco in the Destinations, Restaurants, Chefs' Recipes, Arts, Liquor Cabinet, and Wine Cellar sections. For information and upcoming events in San Francisco, please visit the Only in San Francisco website: www.OnlyinSanFfrancisco.com.